Nuclear factor of activated T-cells, cytoplasmic 2 is a protein that in humans is encoded by the NFATC2 gene. This gene is a member of the nuclear factor of activated T cells (NFAT) family. The product of this gene is a DNA-binding protein with a REL-homology region (RHR) and an NFAT-homology region (NHR). This protein is present in the cytosol and only translocates to the nucleus upon T cell receptor (TCR) stimulation, where it becomes a member of the nuclear factors of activated T cells transcription complex. This complex plays a central role in inducing gene transcription during the immune response. Alternate transcriptional splice variants, encoding different isoforms, have been characterized. NFAT transcription factors are implicated in breast cancer, more specifically in the process of cell motility at the basis of metastasis formation. Indeed, NFAT1 (NFATC2) is pro-invasive and pro-migratory in breast carcinoma. To increase cell motility NFAT1 up-regulates the gene of the Lipocalin 2 expression and modulate the TWEAKR/TWEAK axis. Translocation forming an in frame fusions product between EWSR1 gene and the NFATc2 gene has been described in bone tumor with a Ewing sarcoma-like clinical appearance. 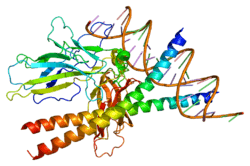 The translocation breakpoint led to the loss of the controlling elements of the NFATc2 protein and the fusion of the N terminal region of the EWSR1 gene conferred constant activation of the protein. NFATC2 has been shown to interact with MEF2D, EP300, IRF4 and Protein kinase Mζ. ↑ "Diseases that are genetically associated with NFATC2 view/edit references on wikidata". ↑ "Entrez Gene: NFATC2 nuclear factor of activated T-cells, cytoplasmic, calcineurin-dependent 2". ↑ Jauliac S, López-Rodriguez C, Shaw LM, Brown LF, Rao A, Toker A (Jul 2002). "The role of NFAT transcription factors in integrin-mediated carcinoma invasion". Nature Cell Biology. 4 (7): 540–4. doi:10.1038/ncb816. PMID 12080349. ↑ Yoeli-Lerner M, Yiu GK, Rabinovitz I, Erhardt P, Jauliac S, Toker A (Nov 2005). "Akt blocks breast cancer cell motility and invasion through the transcription factor NFAT". Molecular Cell. 20 (4): 539–50. doi:10.1016/j.molcel.2005.10.033. PMID 16307918. ↑ Gaudineau B, Fougère M, Guaddachi F, Lemoine F, de la Grange P, Jauliac S (Oct 2012). "Lipocalin 2, the TNF-like receptor TWEAKR and its ligand TWEAK act downstream of NFAT1 to regulate breast cancer cell invasion". Journal of Cell Science. 125 (Pt 19): 4475–86. doi:10.1242/jcs.099879. PMID 22767506. ↑ Szuhai K, Ijszenga M, de Jong D, Karseladze A, Tanke HJ, Hogendoorn PC (Apr 2009). "The NFATc2 gene is involved in a novel cloned translocation in a Ewing sarcoma variant that couples its function in immunology to oncology". Clinical Cancer Research. 15 (7): 2259–68. doi:10.1158/1078-0432.CCR-08-2184. PMID 19318479. ↑ García-Rodríguez C, Rao A (Jun 1998). "Nuclear factor of activated T cells (NFAT)-dependent transactivation regulated by the coactivators p300/CREB-binding protein (CBP)". The Journal of Experimental Medicine. 187 (12): 2031–6. doi:10.1084/jem.187.12.2031. PMC 2212364 . PMID 9625762. ↑ Rengarajan J, Mowen KA, McBride KD, Smith ED, Singh H, Glimcher LH (Apr 2002). "Interferon regulatory factor 4 (IRF4) interacts with NFATc2 to modulate interleukin 4 gene expression". The Journal of Experimental Medicine. 195 (8): 1003–12. doi:10.1084/jem.20011128. PMC 2193700 . PMID 11956291. ↑ San-Antonio B, Iñiguez MA, Fresno M (Jul 2002). "Protein kinase Czeta phosphorylates nuclear factor of activated T cells and regulates its transactivating activity". The Journal of Biological Chemistry. 277 (30): 27073–80. doi:10.1074/jbc.M106983200. PMID 12021260. Rao A, Luo C, Hogan PG (1997). "Transcription factors of the NFAT family: regulation and function". Annual Review of Immunology. 15: 707–747. doi:10.1146/annurev.immunol.15.1.707. PMID 9143705. Crabtree GR (Mar 1999). "Generic signals and specific outcomes: signaling through Ca2+, calcineurin, and NF-AT". Cell. 96 (5): 611–614. doi:10.1016/S0092-8674(00)80571-1. PMID 10089876. Horsley V, Pavlath GK (Mar 2002). "NFAT: ubiquitous regulator of cell differentiation and adaptation". The Journal of Cell Biology. 156 (5): 771–774. doi:10.1083/jcb.200111073. PMC 2173310 . PMID 11877454. Aramburu J, Azzoni L, Rao A, Perussia B (Sep 1995). "Activation and expression of the nuclear factors of activated T cells, NFATp and NFATc, in human natural killer cells: regulation upon CD16 ligand binding". The Journal of Experimental Medicine. 182 (3): 801–810. doi:10.1084/jem.182.3.801. PMC 2192167 . PMID 7650486. Auffray C, Behar G, Bois F, Bouchier C, Da Silva C, Devignes MD, Duprat S, Houlgatte R, Jumeau MN, Lamy B (Feb 1995). "[IMAGE: molecular integration of the analysis of the human genome and its expression]". Comptes Rendus De L'Académie Des Sciences. Série III, Sciences De La Vie. 318 (2): 263–72. PMID 7757816. Li X, Ho SN, Luna J, Giacalone J, Thomas DJ, Timmerman LA, Crabtree GR, Francke U (1995). "Cloning and chromosomal localization of the human and murine genes for the T-cell transcription factors NFATc and NFATp". Cytogenetics and Cell Genetics. 68 (3-4): 185–191. doi:10.1159/000133910. PMID 7842733. Ho S, Timmerman L, Northrop J, Crabtree GR (1995). "Cloning and characterization of NF-ATc and NF-ATp: the cytoplasmic components of NF-AT". Advances in Experimental Medicine and Biology. 365: 167–73. doi:10.1007/978-1-4899-0987-9_17. PMID 7887301. Jabado N, Le Deist F, Fisher A, Hivroz C (Nov 1994). "Interaction of HIV gp120 and anti-CD4 antibodies with the CD4 molecule on human CD4+ T cells inhibits the binding activity of NF-AT, NF-kappa B and AP-1, three nuclear factors regulating interleukin-2 gene enhancer activity". European Journal of Immunology. 24 (11): 2646–2652. doi:10.1002/eji.1830241112. PMID 7957556. Vacca A, Farina M, Maroder M, Alesse E, Screpanti I, Frati L, Gulino A (Nov 1994). "Human immunodeficiency virus type-1 tat enhances interleukin-2 promoter activity through synergism with phorbol ester and calcium-mediated activation of the NF-AT cis-regulatory motif". Biochemical and Biophysical Research Communications. 205 (1): 467–474. doi:10.1006/bbrc.1994.2689. PMID 7999066. Jain J, McCaffrey PG, Miner Z, Kerppola TK, Lambert JN, Verdine GL, Curran T, Rao A (Sep 1993). "The T-cell transcription factor NFATp is a substrate for calcineurin and interacts with Fos and Jun". Nature. 365 (6444): 352–355. doi:10.1038/365352a0. PMID 8397339. Luo C, Burgeon E, Carew JA, McCaffrey PG, Badalian TM, Lane WS, Hogan PG, Rao A (Jul 1996). "Recombinant NFAT1 (NFATp) is regulated by calcineurin in T cells and mediates transcription of several cytokine genes". Molecular and Cellular Biology. 16 (7): 3955–66. PMC 231392 . PMID 8668213. Di Somma MM, Majolini MB, Burastero SE, Telford JL, Baldari CT (Sep 1996). "Cyclosporin A sensitivity of the HIV-1 long terminal repeat identifies distinct p56lck-dependent pathways activated by CD4 triggering". European Journal of Immunology. 26 (9): 2181–2188. doi:10.1002/eji.1830260933. PMID 8814265. Copeland KF, McKay PJ, Rosenthal KL (Jan 1996). "Suppression of the human immunodeficiency virus long terminal repeat by CD8+ T cells is dependent on the NFAT-1 element". AIDS Research and Human Retroviruses. 12 (2): 143–148. doi:10.1089/aid.1996.12.143. PMID 8834464. Hodge MR, Chun HJ, Rengarajan J, Alt A, Lieberson R, Glimcher LH (Dec 1996). "NF-AT-Driven interleukin-4 transcription potentiated by NIP45". Science. 274 (5294): 1903–1905. doi:10.1126/science.274.5294.1903. PMID 8943202. Lyakh L, Ghosh P, Rice NR (May 1997). "Expression of NFAT-family proteins in normal human T cells". Molecular and Cellular Biology. 17 (5): 2475–84. PMC 232096 . PMID 9111316. Amasaki Y, Masuda ES, Imamura R, Arai K, Arai N (Mar 1998). "Distinct NFAT family proteins are involved in the nuclear NFAT-DNA binding complexes from human thymocyte subsets". Journal of Immunology. 160 (5): 2324–33. PMID 9498773. Chen L, Glover JN, Hogan PG, Rao A, Harrison SC (Mar 1998). "Structure of the DNA-binding domains from NFAT, Fos and Jun bound specifically to DNA". Nature. 392 (6671): 42–48. doi:10.1038/32100. PMID 9510247. 2as5: Structure of the DNA binding domains of NFAT and FOXP2 bound specifically to DNA.